Watch Public Radio's Best In-Studio Performances Of 2014 Public radio stations across the nation capture thousands of in-studio performances every year. Here are their favorites from 2014, including Wussy, the Revive Big Band and Interpol. 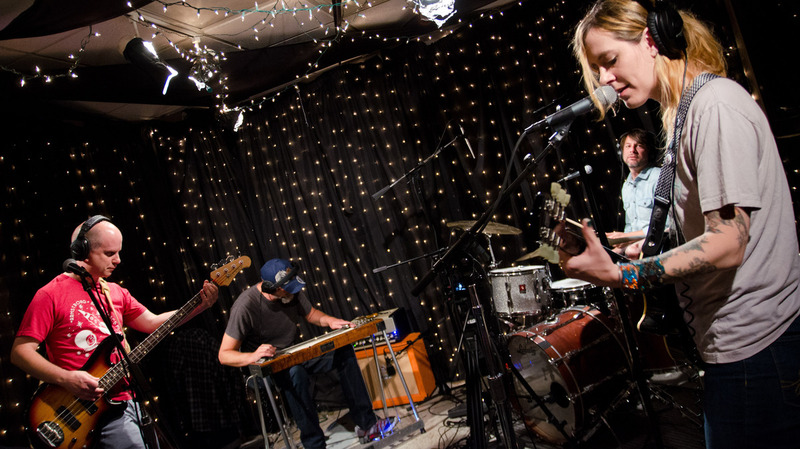 Cincinnati indie rockers Wussy were the featured musicians in KEXP's favorite studio session of the year. Every year, public radio stations across the nation invite musicians of all stripes to perform live in their studios. When these sessions are captured on video, they invite us to experience the intimate energy the artists bring to a small-scale live performance. We asked some of our station partners to each choose just one favorite studio session out of all they recorded in 2014. The results, including a heartfelt indie rock band from Cincinnati, a 20-year-old pianist with an affinity for the playful side of Bach, a Grammy-winning treasure of American bluegrass and a 19-piece ensemble that combines the traditions of big-band jazz and classic hip-hop crews, cut across genres. Watch all 16 of public radio's favorite sessions of the year below.